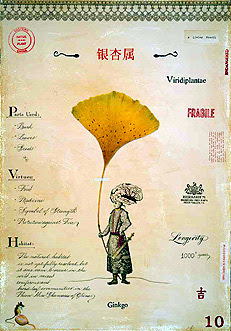 Ginkgo with Chinese man - 14 x 20" by M.F. Cardamone from Pennsylvania, USA. "The mission of this work is to record and document what's become of the plants in our modern culture by contrasting their past and present life histories . I wanted to do this in a way that's entertaining , educational, unusual and unexpected."